Choosing the best integration solution for your company has never been tougher. After all, with the plethora of integration tools available today, in some ways it has never been easier to move data around. The sheer range of options, however, is overwhelming, especially as huge differences between systems can make direct comparisons difficult, and what works for one integration project may not work for another. Given the importance of integration, selecting the wrong solution is expensive in all respects: cost, lost time, and missed opportunities. Clearly, it’s important to make a good choice, especially for critical business opportunities. 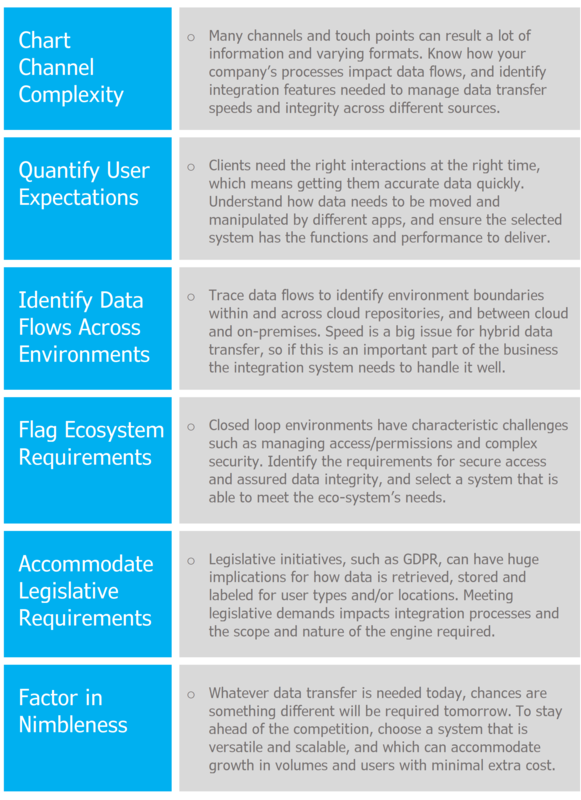 Following is a summary of six key areas that impact data transfer today. With so much to consider, data integration is no longer the realm of simply shuffling data around. Rather, it needs to be viewed as a means of supporting the delivery of highly competitive applications in the context of business processes and data flow. The following table presents ways of managing the complexity associated with today’s business and market demands. Choosing an integration approach, whether for a specific project or a companywide standard, will be most successful when the entire data requirement – from client need to delivery mechanism to environments – is understood and agreed. Only then should the selection process begin. Next week’s post will look at three categories of integration solutions and will suggest ways to match them to the identified business need. InaPlex specializes in data integration and CRM migration services and solutions, with a focus on difficult, niche projects. Our licenses are in use throughout the world and our International Services Team provides implementation and app development. Contact us today for a free presentation, or to chat through your tech needs with one of our consultants. Read on for a list of FAQs for companies looking to migrate their CRM data. This post looks at how to avoid the challenges associated with migrating to a new CRM system. ERM Consulting recently managed a challenging CRM and ERP integration and data migration project for imc Meßsysteme GmbH. This post describes the challenges and how they were overcome, as well as the role Inaport played in delivering a successful solution. Richard Race-Lyons, a consultant with Leverage Technologies, shares with us his first experience with using Inaport for a CRM upgrade.